From my experiences at the southern part of The Grand Staircase- Escalante NM, getting to The Wave Trailhead, the road conditions do change with the weather. I was glad I had rented the 4x4 Jeep for the day of our hike to ensure I could get there, as it rained the day before. I had been cautioned about the slippery clay spots on the road when there is rain, the washboarding of the road, and the deep ruts from vehicles and runoff, by the rangers at the visitors center. I knew going to the northern part of Escalante in UT, I was going to face the same road conditions. 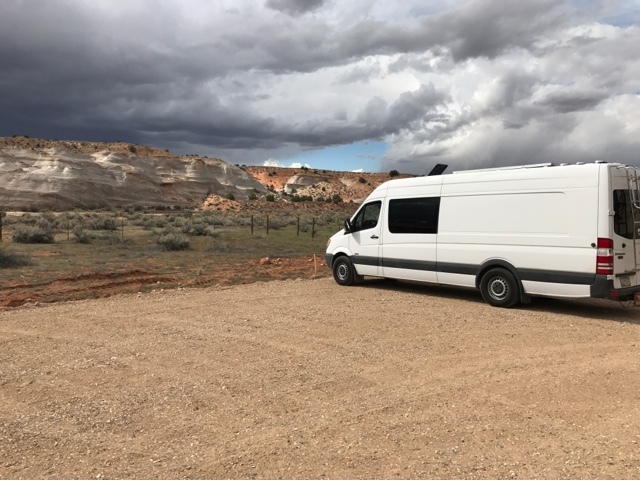 When I told Joanne that I was going north she was also interested in seeing the area and she offered to use her high clearance Sprinter van where needed for both of us to explore what there was to see.. 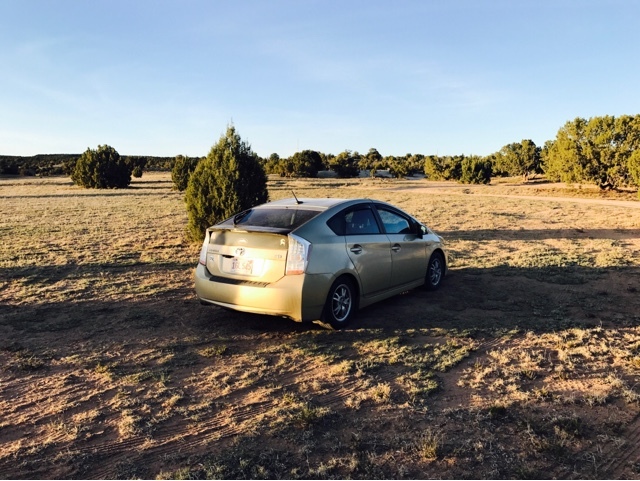 I take my Prius many places in my travels. There are some places I just can't go due to clearance height and there are places that if I'm careful I can make it. The biggest risk of problems with the Prius is bad roads. Grand Staircase - Escalante National Monument has the worse roads I have ever tried to drive on with my Prius. Above I'm at the Hole In The Wall Road disbursed campground. The roads in the campground were heavily rutted in sections, uneven, and gullies. It was better for me to drive off-road than to use the road, as they were so bad. The woman we met at the Visitor Center was proud to say they had just graded the northern section of the Hole In The Rock Road. I found the grader had left a ridge at one entrance to the campground that made it impossible for my Prius to get over it. I needed to use the rutted road into the campground in it's place. The other choice would have been to find a shovel to break the graded brim down as I did at the RTR. The first day of exploring we decided to drive the Hole In The Rock Road as far as we could. We didn't know if the Prius could make it so Joanne drove us in her Sprinter and it worked well from a high clearance over and around deep ruts. The last 20 or so miles of the 60 mile road my Prius would not have made it. Her van with its high clearance did very well until the last 10 mikes and we eventually turned around believing it should only be attempted with a 4x4. The side roads to Devils Garden and Dance Hall Rock were well maintained and the Prius would have made it on these roads if I had taken it. All other dirt roads to locations and trailheads needed high clearance and in some cases 4x4. My message to those that wish to explore GSENM is that you need a high clearance vehicle. All wheel drive crossover vehicles did well even where 4x4 was recommended, but the roads were dry for our visit up there. If the roads are wet they are impassible where there are clay patches or sections that turn so slippery that getting through with 4x4 is not possible at times. It's a beautiful area to visit but planning ahead to have the right vehicle is important. 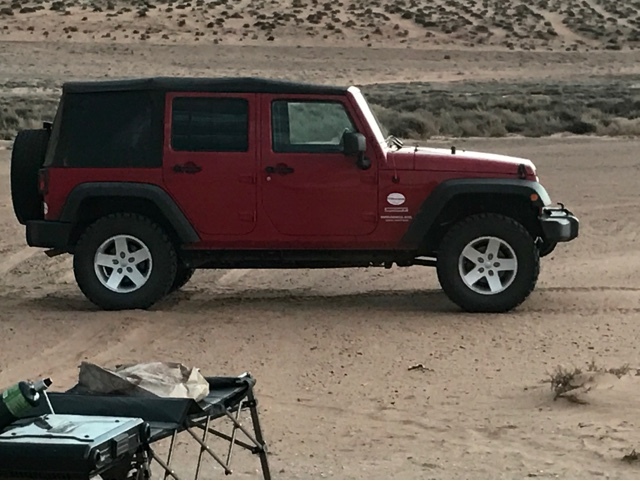 I was lucky to have met up with Joanne, not only for our wonderful hikes to Havasu Falls and The Wave, but we got to also share our efforts and vehicles to see as much as we did. When I return to UT Escalante I may plan on renting a 4x4 for at least two days to access trailheads that were too hard this year, or use my Tacoma pickup truck for my 2017 Travels and go to as many places that require clearance or 4x4 that I wouldn't take my Prius. It's a thought I am still thinking about.